Remodeling your basement into a game room is always a good idea. The original purpose behind a basement was shelter from tornadoes and/or hurricanes. While this is still a necessity in some places, in other places a basement is just an extension to the home. Basements come in all shapes and sizes too. Some basements are large enough to make a small guest house and some are barely big enough use as a laundry room. 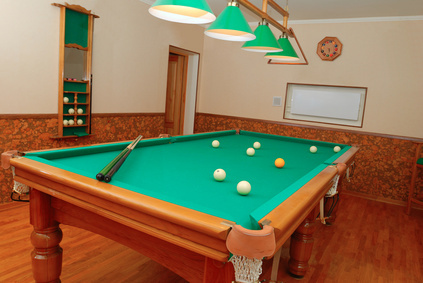 A game room is really just a room that is specifically designated for entertainment purposes. From pool, board games and table top games to bars, television sets and video game consoles, a game room has to be specifically designed to meet your entertainment needs. A basement is an excellent place to build a game room because it is out of the way, usually separated from the rest of the home by stairs and therefore private. If you are planning to remodel your basement, converting it into a game room is always a great idea. So build in a bar, buy that pool table you've always wanted, install a TV set with surround sound for your favorite sports events and put in a couch or two for all your friends. The Internet has become a great place to work. More people telecommute to work now than ever before. Everyone from freelancers to entrepreneurs is working from home and needs to have a special place to get the job done. A basement is a perfect location for a home office because it is usually quiet and away from all the hustle and bustle throughout the rest of the house. Also, going to a home office in your basement will feel more like actually going to work than just setting your laptop on the coffee table. If you have plans to remodel your basement into a home office, then make sure you install plenty of lighting, insulation in the walls and work space such as desks, chairs and a couch. If you have plans to remodel your basement but don't know what you want to use the space for and you are a movie enthusiast then the answer is easy, transform your basement into a home theater. A basement is usually dark because it is underground and therefore has little to no windows. A surround sound system is less likely to cause complaints from your neighbors because the rest of your home and the ground insulates the sound. So go ahead and have that projector installed, take up a whole wall for your screen, put in plenty of seating, very few lights and pop a bag of popcorn.